After three consecutive Top 5 albums, 750,000 sales and three sold-out headline tours, The Overtones continue to reboot classic sounds for contemporary audiences. February 9th sees the release of their fourth collection ‘Sweet Soul Music’ on Warner Music Entertainment. Recorded at Sarm Studios with producer Julian Hinton (Seal, Rumer, Trevor Horn), ‘Sweet Soul Music’ is a tribute to doo-wop and soul pioneers such as The Drifters, Al Green, Marvin Gaye and The Temptations, artists that The Overtones grew up listening to and who have influenced them throughout their career. The Overtones transport their audience back to the heady 1960s, when ground-breaking television shows on both sides of theAtlantic like ‘Ready Steady Go’ and ‘The Tami Show’ launched such era-defining artists as James Brown, The Temptations, Jerry Lee Lewis andThe Supremes. 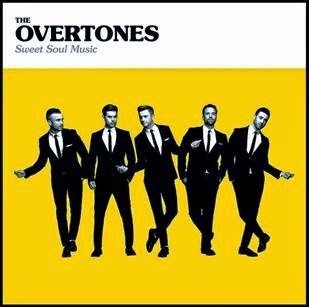 The Overtones’ three albums to date – ‘Good Ol’ Fashioned Love’ (2010), ‘Higher’ (2012) and ‘Saturday Night At The Movies’ (2013) – established their reputation as a group with the unique ability to deliver consistently uplifting music infused with exquisitely crafted vocal harmonies. Aside from working on ‘Sweet Soul Music’, recent months have seen the boys join forces with the legendary Michael Ball on ‘Let It Be Me’, which was the first single to be taken from his new album ‘If Everyone Was Listening’. Timmy Matley also triumphed as the winner of BBC Children in Need’s Great British Sewing Bee. Tickets go on sale from 10am on Friday December 5th. They’ll be available from www.gigsandtours.com, www.ticketmaster.co.uk,www.ticketmaster.ie, 0844 811 0051 and 0844 826 2826.